Geomatics Engineering Technologist & Senior Party Chief @ Rayworth & Roberts Surveys Ltd. I first became interested in the field of geomatics at the age of 17 after attending a college Information Fair held at Saint Mary’s Bay Academy. As the occupation was explained to me I knew this was what I needed to do. Surveying can offer a mix of outside and inside work, as well as the opportunity to work with cutting edge technologies. I sent my application to the NSCC’s Centre of Geomatics Sciences shortly after. I graduated from SMBA in 2009. I spent a total of two years at COGS, completing both the Survey Technician and the Geomatics Engineering Technologist programs. While at COGS, I learned a great deal about Computer Sciences, GIS Programs, Mathematics, Drafting Software’s, Mapping, Survey Law and Field Procedures. It was at COGS that I first heard of the CBEPS path to obtaining a Nova Scotia Land Surveyors license. This led me to take additional classes in astronomy, and to learn about the motions of the stars and how to use them to map positions on the earth’s surface. With my first-year of COGS background, I obtained employment as a construction surveyor. My primary responsibilities were to perform quality control on the other surveying work, design and grade various road surfaces, and to position wind turbines with millimeter accuracy. After my second year of COGS, I was offered full time employment as a surveyor’s assistant with Rayworth & Roberts Surveys Ltd. I became a Canadian Board of Examiners for Professional Surveyors candidate soon after. I spent the next few years while employed, studying and writing core examinations to obtain my CBEPS Certificate of Completion. I took correspondence courses with the British Columbia Institute of Technology to gain insight into more advanced geomatics topics. I learned many different aspects about job planning, error propagation, statistical analysis, deformation surveying, and vertical and horizontal tunnel surveying. While working at Rayworth & Roberts Surveys Ltd. 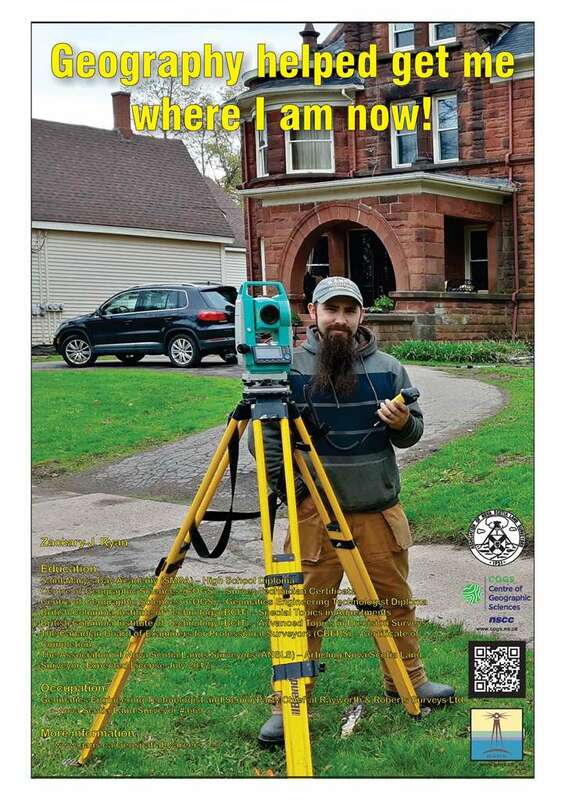 I became a Candidate Member of the Association of Nova Scotia Land Surveyors. I began to article under a land surveyor and, over the years, gradually gained more responsibilities within the company. I have had a chance to work on many different aspects of the geomatics field while working here. I am routinely called upon to apply my knowledge in geomatics for Construction, Legal and Deformation surveys. I have had a chance to see more of Atlantic Canada than most people get to in a lifetime, and have provided my services as far as Alberta. After completing my articling, I became a licensed Nova Scotia Land Surveyor in 2017.